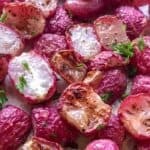 Roasted Radishes are the perfect keto side dish. Fresh and flavorful radishes are tossed in olive oil, garlic powder, salt and pepper then roasted to tender perfection! These little red beauties are perfect along side a steak in place of potatoes… add a sprinkle of parmesan and a dallop of sour cream for a real treat! I always find it pretty simple to find keto main dishes to cook, like grilled chicken or steaks or these fajita turkey burgers. When it comes to side dishes, I often find myself in a rut preparing the same old dishes over and over. 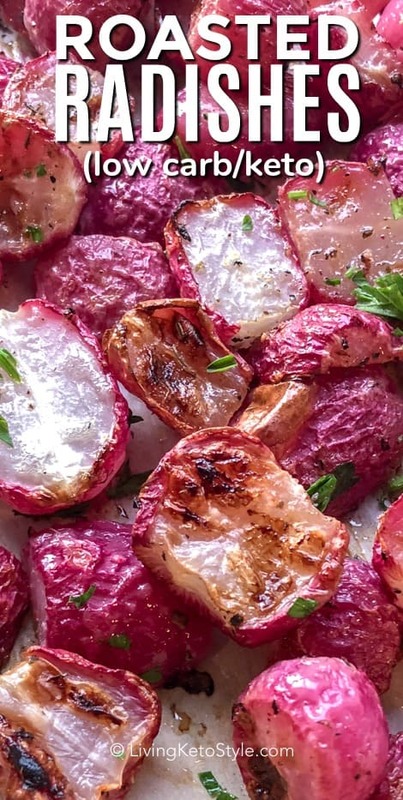 These roasted radishes are a favorite for sure! 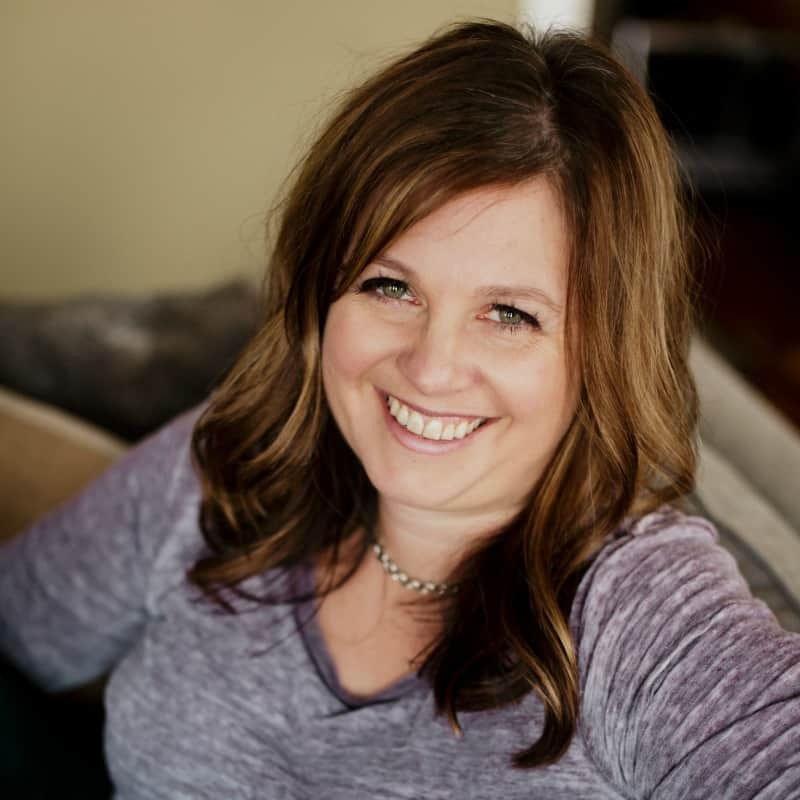 I love serving them alongside just about any main – steaks, chicken, pork… you name it and I also love that I can easily change up the seasonings or use them as a base for any recipe calling for roasted potatoes. Radishes have a naturally strong flavor to them. 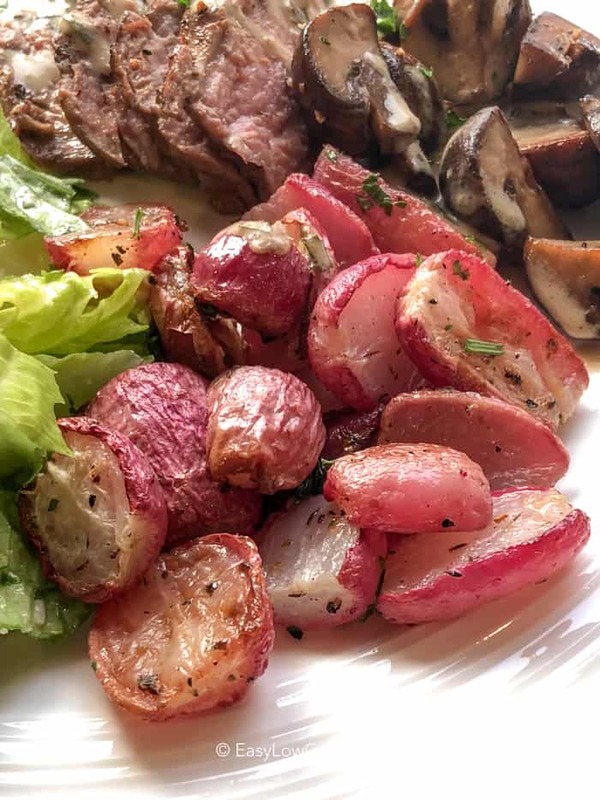 Much like onions, cooking them really helps to eliminate the strong taste and leaves you with a deliciously tender and slightly sweet side dish that makes me never want to go back to regular roasted potatoes again! Roasting radishes, or any root vegetable for that matter, is a pretty straightforward process. 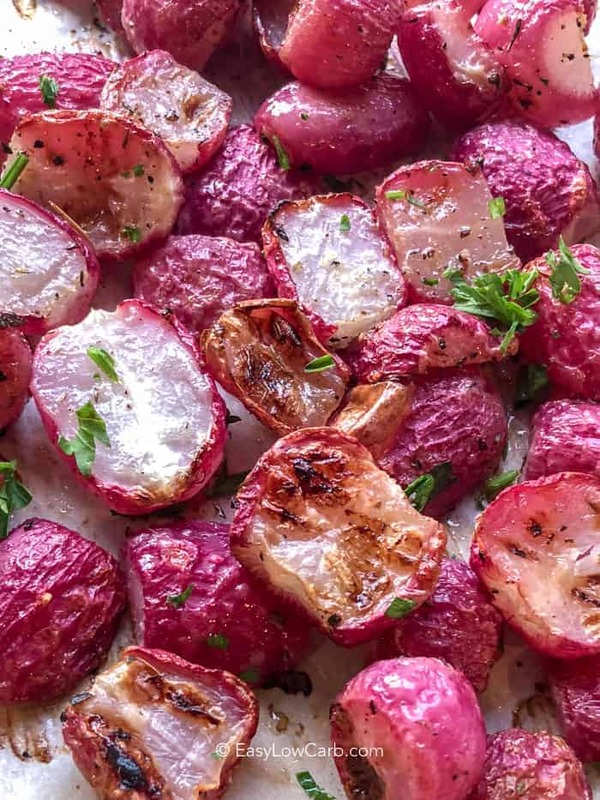 Start by preheating your oven to 400 degrees F. While it preheats, line a baking sheet with parchment paper so your delicious radishes don’t stick to the pan while they roast. Cut the tops and bottoms off of your radishes. If you have any larger ones, chop them in half so that everything cooks evenly. Toss your radishes in olive oil, then toss the seasonings in until everything is coated nicely. Spread them out evenly on the baking sheet, and pop them in the oven. Roast the radishes for about 25-30 minutes or until fork tender. I like to flip mine half way through with a spatula to make sure they roast evenly. Serve ‘em while hot with your favorite main dish, or allow them to cool and add them to a nice salad! Tender seasoned radishes are the perfect side dish to serve with steaks! Preheat oven to 400°F. Line a baking pan with parchment paper. Wash radishes and remove tops and bottoms. Cut larger radishes in half lengthwise. 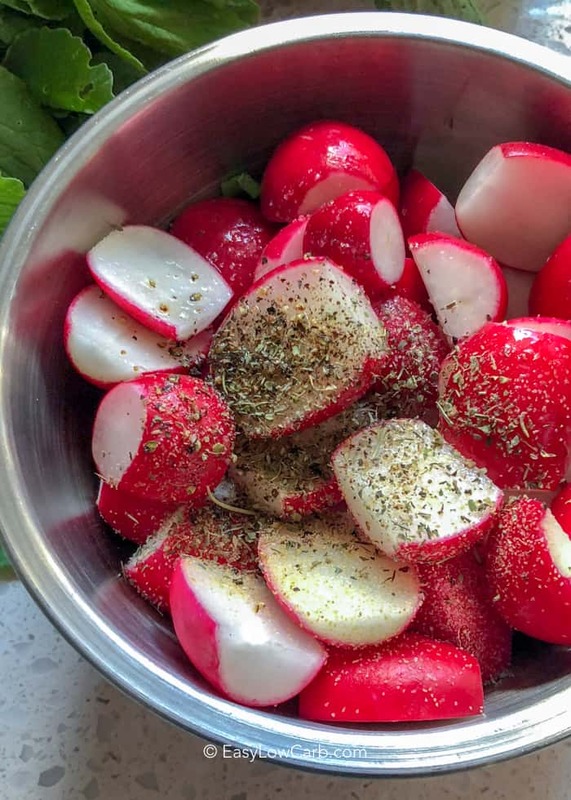 Toss radishes with oil and seasonings. Spread onto baking pan and roast 25-30 minutes or until tender. Let me know how they turn out! Thanks for the tip.